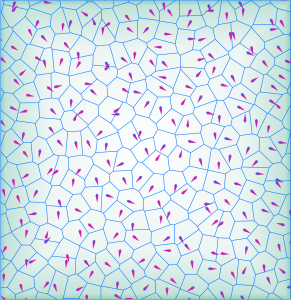 The Non-Equilibrium Soft Matter group employs a combination of theory, analytical modeling, and computer simulations to study the structural, dynamical, and mechanical properties of materials that are inherently out of equilibrium. Virtually all liquids can undergo a transition toward a glassy (i.e. amorphous solid) phase when cooled to below their melting temperature. Remarkably, while this phenomenon has been experimentally known for centuries and is exploited in a wealth of applications, understanding the physics behind the glass transition still stands out as “the deepest and most interesting unsolved problem in solid state theory”. We work on the development of a novel microscopic theory that can accurately predict the complex dynamics of glass-forming materials on a strictly first-principles basis, providing a promising new framework to elucidate various poorly understood glassy phenomena. Active materials are composed of particles that can convert energy into autonomous motion. This renders them intrinsically far from equilibrium, resulting in rich dynamical and self-organizing behavior that defies the laws of conventional equilibrium statistical mechanics. Examples in nature are abundant and occur on all length scales, ranging from the cellular cytoskeleton to macroscopic bird flocking. Artificially created active particles have also recently become available, offering potential applications in bio-sensing and targeted drug delivery. 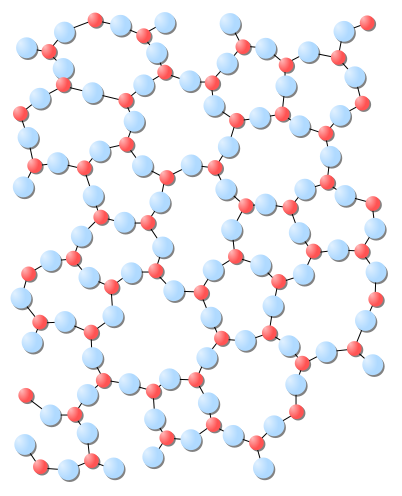 We employ theory and particle-resolved computer simulations to study the emergent behavior of such active materials. In current research we explore the role of geometric and topological constraints, the emergence of mechanical stability, and aging and rejuvenation behavior in active matter. The l iving cell represents a magnificent example of responsive, smart, and programmable matter, combining the ability to sense changes in its environment with the means to adapt in a quick and effective manner. We seek to study and ultimately harness the physical principles underlying this responsive behavior to design and control novel bio-inspired and smart materials. We are mainly interested in systems that exploit properties of both glassy and active matter, such as active disordered (bio-)networks, actively doped glasses, and vitrimers—a new class of responsive polymers. Previously, I also worked in the field of molecular quantum physics, focusing on quantum-mechanical first-principles treatments of molecular photodissociation, scattering processes in an external field, and ultracold controlled chemistry.